In an international comparison, CEECs show a relatively strong economic growth performance coming close to that of the first and second tier of Asian Tiger countries over the past decade, which emerge as the best growth performers (setting aside China). In recent years the CEECs' dynamic growth performance has even accelerated despite an economic slowdown in their most important trading partners. Despite being considerably smaller than their competitors in East Asia (taken together about half the size of China), the CEECs have gained a very considerable market share in the EU15 which is their main export market. As in many respects, the new EU member states among the CEECs are considerably more advanced than the three accession/candidate countries, Bulgaria, Romania and Croatia (in the following candidates for short). The pronounced reduction in their trade deficits, despite weak demand in their major trading partners and a strengthening currency, is a sign of improved competitiveness in the new member states. The candidate countries show less favourable developments with growing imbalances despite sometimes high export growth. While trade balances in goods production might turn to become positive for the new members as this reflect their longer-term comparative advantages the old members are likely to maintain a competitive edge in advanced business services. The strong degree of integration in production is thus reflected in deteriorating services trade balances for the new members on the one hand as well as through the importance of FDI in these countries on the other hand. The recent privatization has certainly put CEECs in a special position with respect to FDI, however their attractiveness as destinations for foreign capital remains undisputed given the numbers. In terms of infrastructure (human capital, telecommunications, etc. 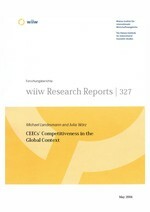 ), the ease and reliability of doing business, and the like the new members occupy rank four behind the two groups of advanced economies (EU and other OECD) and the first tier of Asian Tigers – the candidate countries rank generally lower, thus having to defend their position more intensively against competition from the second tier of Asian Tigers and emerging market economies such as Turkey and Mexico. The two giant emerging markets China and India still have a long way to go to catch-up in these qualitative indicators. A distinguishing feature of the new members is their strong performance in terms of human capital and business infrastructure, which is yet not totally matched by an equally strong performance in institutions guaranteeing a reliable and sound business environment. A detailed analysis of the manufacturing sector has shown that the NMS have moved rapidly in changing the composition of industrial production and exports in the direction of a strong representation of medium-high tech industries (i.e. industries with a higher technology and know-how content). Unit labour cost comparisons show that the NMS are not particularly competitive in labour-intensive, low skill industries. This is partly due to a gradual loss of cost advantages in these areas and also due to the increasing import pressure from China (and other low cost producers) in European markets. Some of the NMS (such as the Czech Republic and Hungary) have also improved their positions in higher-tech areas (especially electronics, electrical engineering, precision instruments, etc.) which are areas in which Asian catching-up economies are extremely strong (especially in electronics and computing equipment). A range of indicators (on relative productivity developments across industries, trade specialisation indicators, etc.) all reveal a picture of a dynamically changing pattern of industrial and trade specialisation of the NMS within the European division of labour. An analysis of price versus quality competition (a success in the latter was defined as an improvement in the market share of a producer when its relative price has actually increased) revealed that the NMS were particularly successful in improving their position in quality competition in comparison with other catching-up economies. Such improvements took place across all types of industrial groupings (grouped again by technology intensity) but they were particularly strong in the medium-high tech areas of manufactured commodities; in these areas the NMS (more detailed analysis revealed that this was due particularly to the performances of the Czech Republic, Hungary, Poland and Slovakia) occupied a real outlier position. The candidate countries showed their usual features of lagging (so far) in these developments. However, a too simplistic view of a 'convergence' process would also be misleading: Particularly in the course of the catching-up process (i.e. when NMS have not yet reached the productivity, wage and income levels of the more advanced economies) there is a lot of scope for inter- and intra-sectoral specialisation and differentiation. This characterises regional developments within countries and also cross-country regional developments and can be observed currently both in the European, the Asian and the global context.